HONOLULU (HawaiiNewsNow) - Hawaii's Congressional delegation is slamming the Trump administration for separating children from their parents at the U.S.-Mexico border. The statements come amid a growing backlash against the new policy, which is being criticized from those on the right and the left. First Lady Melania Trump and four former first ladies have also joined the call against the policy. On Monday, U.S. Sen. Mazie, Hirono, D-Hawaii, called the decision to separate immigrant kids from families "reprehensible." 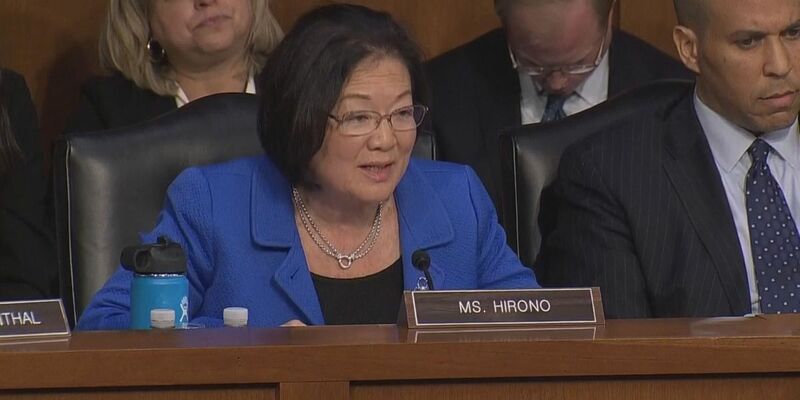 "They need to step up and act like decent Americans who understand the history of our country and the role that immigrants have played," Hirono said. "The word 'hypocrisy' doesn't even begin to describe the fact that more of them have not come forward." U.S. Sen. Brian Schatz took to Facebook to say the policy was a "moral outrage." He quoted the Bible, George Washington and others to make his point. "We can disagree on immigration policy. But we cannot disagree on what's happening at our southern border," he said. "It is a moral outrage. And you do not have to take my word for it." In a news release, U.S. Rep. Colleen Hanabusa, D-Hawaii, said Trump's assertion that Democrats are to blame "for his deliberate decision to prosecute all asylum seeking families at the border for illegal entry is the latest lie being peddled by his administration. "Trump's policy violates asylum laws and the constitutional rights of parents." U.S. Rep. Tulsi Gabbard, D-Hawaii, came out against the policy earlier this month and told Hawaii News Now on Monday that, "The Trump administration's use of children as pawns in the immigration debate is despicable and must end immediately. We obviously need comprehensive immigration reform." Meanwhile on Monday, an unapologetic President Trump defended his administration's border-protection policies. Calling for tough action against illegal immigration, Trump declared the U.S. "will not be a migrant camp" on his watch. Images of children held in fenced cages have fueled a growing chorus of condemnation across the country. The children are being held separately from parents who are being prosecuted under the administration's "zero-tolerance" policy for illegal border crossings. Nearly 2,000 children were separated from their families over a six-week period in April and May, after Attorney General Jeff Sessions announced the new "zero-tolerance" policy that refers all cases of illegal entry for criminal prosecution. Prior procedure had limited prosecution for many family entrants, in part because regulations prohibit detaining children with their parents since the children are not charged with a crime and the parents are.